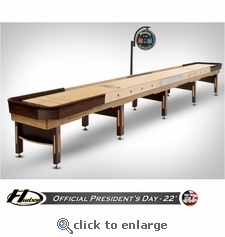 Home > 22' OFFICIAL TABLE of the 2014 PRESIDENT'S DAY TOURNAMENT - LIMITED EDITION - ONLY 1 LEFT! 22' OFFICIAL TABLE of the 2014 PRESIDENT'S DAY TOURNAMENT - LIMITED EDITION - ONLY 1 LEFT! LIMITED EDITION - ONLY 12 MADE AND ONLY 1 LEFT! Now is your chance to own one of the 12 tables used in the 2014 President's Day Tournament. Played on by the best shuffleboard players in the world, these 22' tables are constructed of the finest hard rock maple and built from the ground up 100% in the USA! The 2014 President's Day Tournament will take place February 12-17 at Volcano's Sports Bar in Hurst, TX. Once the event is finished, these tables will be cleaned, polished, crated, and then shipped directly from the tournament to you. Installation is also available. Also Included is One Set of Eight Playing Weights with a Wooden Storage Case, State of the Art Electric Scoring with 18” Solid Wood Scoreboard, 2 Bottles of Speed Powder, One Can of Silicone, 5 Inch Adjustable Leg Levelers, and One Board Wipe. Enjoy Playing Shuffleboard on the Same Tables as the Pros! •Solid 3" Thick Select Hard Rock Maple Playfield with our Polymer Finish (Lifetime Warranty). •Cradle is Solid Maple and Poplar with a Red Mahogany, Golden Oak, and Natural Finish. •Solid Legs with Natural Trim Pieces. •Arrows on Playfield for Aiming. •18" Solid Wood Scoreboard with State-of-the-Art Electronic Scoring.